Vegan Chili - Best Chili Ever! Vegan Chili That Everyone Will Rave About! 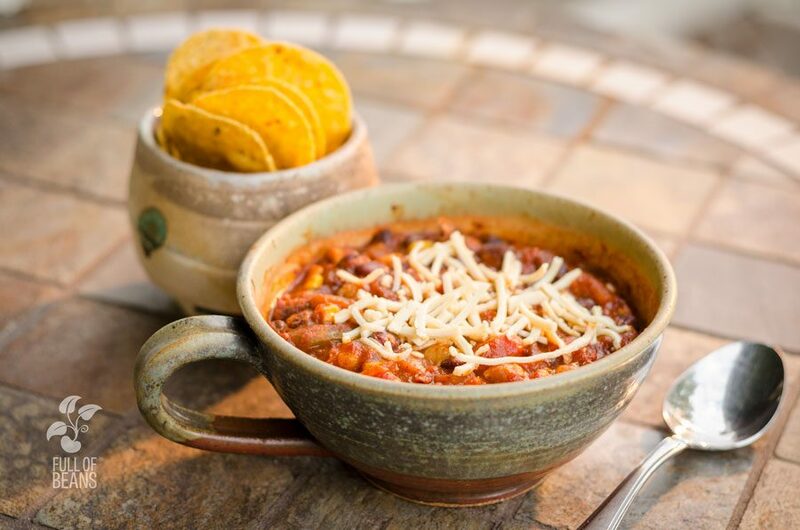 This recipe for vegan chili has been part of our “go to” meal line up for years. It has made appearances at fund raisers, family dinners and pot luck suppers, getting rave reviews. You will love how simple and fast it is to pull together and how easy it is to multiply the recipe. I first made this chili when my kids were young and we served it with a bowl of corn chips. We called it as “thick enough to sit on a chip chili”. Most days we still eat it that way, but it is also great with a side of corn bread or rice. This chili developed an enthusiastic following at a rowing fund raiser we were involved in for years, causing people to start asking for the “vegetarian chili”. I called it that because I realized that people often associate vegetarian with being healthy and vegan as being extreme. When they asked about the chili, I would smile and say, “It is actually vegan. 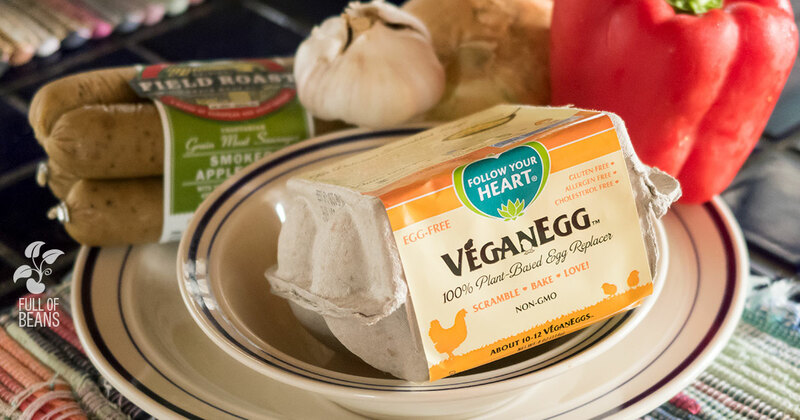 But I knew some people would be afraid to try it if I called it ‘vegan chili’.” Because of the popularity of this vegan chili we have had many opportunities to share vegan food with friends, family and strangers. A year ago, my son and his girlfriend, students at Bowdoin College, used the recipe for a chili cook-off in one of the dining halls. While it did not win, the dining service was impressed enough with the chili to make it part of their regular rotation of vegan offerings in the dining halls. That is a win to me! Mild or Hot, it’s up to you! As I mentioned, this vegan chili recipe was created when my kids were small so the level of heat and spice in the basic recipe is appealing to the gentlest of palates. We have since turned up the heat by adding hot sauce or red pepper flakes to the recipe and I often add a tablespoon of hot sauce and a tablespoon of agave. Consequently, you can adjust it to your own level of desired heat quite easily. This dish is also a great one for introducing vegan, or vegetarian, food to suspicious carnivores. Occasionally, I have tossed in a package of veggie crumbles to give them the mouth feel they are used to. We don’t often use the analog meats, but they can be an invaluable transition food for many people and a life saver for vegans who live with and/or cook for non vegans. So, get ready to really WOW the taste buds of anyone you make this for (I bet they won’t believe it’s vegan). This vegan chili has more than enough taste and heartiness to satisfy anyone! A bowl of chips, some vegan shreds, and it’s Vegan Chili Time! 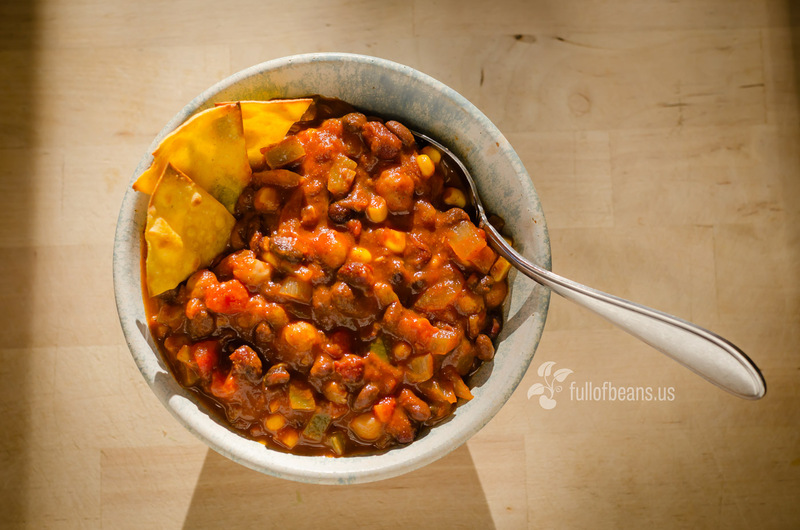 Super delicious, easy to make, crowd pleasing, nutritious, and tasty vegan chili! add remaining ingredients and heat, covered, over moderate heat, stirring occasionally, for about 30 min. When cooking for suspicious carnivores, or nervous “almost-vegans” I have on occasion thrown in a package of veggie crumbles to give them the mouth feel they are used to. It’s a good use for the “analogue meats”. Killer Vegan Chili is GREAT!! Even my skeptical non-vegan spouse loved it. I added cayenne pepper, we like spicy, and a can of Great Northern beans (yes, more beans!) and topped it with chopped cilantro. Will be a repeat many times over, really good! Thanks for being in touch. We’re so glad you enjoyed the chili. Tomatoes are a taste we love so we “get it” about it being a little much for some folks. Sounds like you did what was exactly right for your taste – which is something we heartily approve of! I made your chili for the first time last night and love it. I had to modify the recipe a little since I misread and cooked 4.5 cups of dried beans. Im a new vegan and this will be a go to recipe. My friend is getting married this spring and im brigning a vegan option and I think this will be it. You cant feel left out of the roasted pig when you have this beautiful chili on your plate. hi Sam, wow, that sure is a lot of beans! 🙂 But, we find that the chili is even better left over. Good thing! we are so glad that you liked it and thank you so much for letting us know. That’s really exciting about having an opportunity to share it with others. They will absolutely love it, we are sure. as for the roasted pig, yes, anything that can keep you away from that is a good thing. Thanks for visiting our blog. We are delighted that you are thinking about making the chili. The spot that Sam got himself into was because he used the cooked beans measure for DRY beans. Since they expand over twice when cooked he had a LOT of beans!! So, if you are using canned beans you simply need 1 15oz can of each of the types of bean. That makes the basic recipe which will be plenty for four with a bit of left over. It’s delicious – we know you will love it! Okay . So it’s definitely 3 cans of beans total ? Yes, 3 cans total (one of each type of bean). Thanks for trying the chili – please let us know how you like it! Yummmm!!!! I love it, I swapped out the sugar for maple syrup because I didnt have agave, nor did I want to use white sugar. I also didnt have the tomato sauce so I used a cup of vegetable broth instead. Still tastes wonderful! Hi Brittany! Well, we absolutely care that people aren’t confused. We had added “each” to the “1 1/2 cups of…” direction after an earlier comment. After your’s we just added “4 1/2 cups total’ to the direction. Hoping that the recipe is clear now. Do you think so? This is my go to chili recipe now! Thank you so much! It’s 2:00 in the morning here where I live and I just made this chili. It is soooo yummy! I just ate some for .. a late midnight snack and ready to have some for breakfast in a couple more hours 🙂 So easy to pull together and with so few spices I was really surprised at how great it taste. Up late, making our chili? Wow! So glad that you liked it and I bet that’s going to be a really good breakfast, too. ? Do you think I could make this in a crockpot? Oh absolutely! Except for the onions, which are sautéed, you really are only heating all the ingredients. We do find that the chili improves the next day after all the flavors start to meld together. In that sense a nice long cook in a crock pot on low/medium would probably be just wonderful. Let us know what your results are like! Really sorry that we missed your comment and didn’t respond a little faster. The “tomato sauce” isn’t ketchup, it’s a plain tomato sauce that you can buy just like tomato paste and diced tomatoes. You should be able to find it canned or jarred at your market. Hi! Do you have a slow cooker version of this? As long as you start with cooked beans (caned or otherwise), you will be fine in a slow cooker. Just add al ingredients and cook for 6-8 hours or so on medium. That’s what I would do. I’ve been searching the net for days looking for a crowd pleaser to feed all my carnivore friends at a cosy get-together I’m hosting this weekend. I’m definitely serving this as my main meal! Looks delicious and perfect and so simple! Thank you! So glad that you found us and that you are thinking about making the chili. Please let us know how it goes! Hello I’m not a big corn eater what would be a good substitute for that? Well, thats an interesting question. You could simply leave the corn out or, perhaps, add another pepper. Give it a try and let us know what you think! Thanks for checking out that recipe – hope you have a chance to take a look at some of the others we have here. Thanks for the recipie! Currently eating some right now and it is delicious! Hi Azra! That’s wonderful, thanks for letting us know! This looks amazing! I’ve been searching for a hearty vegan chilli for a while now and can’t wait to try this 🙂 thanks for posting! Thanks for the comment. We hope you DO try it and hope that you LOVE it! 🙂 Let us know if you give it a try. I’ve just made it and it tastes absolutely amazing. I must admit that I used your recipe as a base and modified it a little bit to make it more exciting for a meat-eater like myself. I added garlic, oregano, basil and a dash of cocoa powder. This recipe will definitely become one of my staples. Thank you so much! Hi Carolin, thanks for giving it a try. So glad that you enjoyed it and those tweaks sound yummy! How would you do this for a freezer version? Hi, Amanda! Freezing is no problem. Just make a batch of chili (cooked) then place whatever you’d like to freeze into a container for the freezer. We often use 1gal ziplock bags for this. Because you can sort of flatten them its a lot faster when its time to thaw out (plus they are flexible so the freezing expansion isn’t a problem) – but any convenient container will work. For someone on a budget..buying three different kind of tomato ingredients is a lot. Can I use just one? So sorry that it took us a while to get back to you. We absolutely understand being on a budget and cost conscious. That’s how we are too! Those three tomato products really aren’t all that pricey usually, around here. They are the sort of supplies that we have on hand because they are so versatile. We buy them in quantity when they are on sale – that really helps with the price of course. You can certainly give the recipe a try using just one of them, but it will change the consistency and the taste. Also, you might consider compensating for the lost volume and fluid (if you leave out the sauce or diced tomatoes. But give it a try, see how it works and let us know. It certainly won’t be “bad” it will just be different. How long does it stay good in the fridge after cooking? You can easily have it in the fridge for a week. If you are concerned that it will stay uneaten longer than that you can place a portion of it into the freezer – it keeps fine! Well, we’re awfully sorry that you are having this experience with our chili recipe. We have made it many many times every year, for years. We have served it at events, for get-togethers, to friends, to family, it has been in chili cook-offs, added to the menu oration at our son’s college, and it has been made by many readers of this blog – all to rave reviews and may compliments. I can’t imagine what is causing your experience to be so different. But thank you for giving it a try – wish we could make it for you because I’ll bet you would love it. Thank you so much! The name is perfect for this recipe. This is hands down, the best chili I’ve ever had! My boyfriend and I absolutely love this chili. One of our favorite vegan meals. I added about a quarter of a fresh jalapeño in the chili as well just to give it a little more spice. I think next time, I may add a few mushrooms in their too for some more texture. Your awesome! Keep the recipes coming!! We are delighted that you like the chili so much (we feel the same way, to be honest). Adding a touch of jalapeño sounds like an excellent idea. You can bet we will keep working on making great things for you to try. 🙂 Make sure you are on our email list – we will be getting out some regular emails with new posts – you’ll know as soon as we have them. Thank you for the recipe will be trying it tonight definitely looking forward to since it is currently -14 degrees where I live, a big bowl of this will help keep us warm and cozy. I did have a question should I rinse the beans first or through them in with their juices? So sorry that we missed your question from yesterday. If you are using beans from a can then drain and rinse is the best approach. Since you asked the question, we will update the recipe with that note. Hope you enjoy the chili and that it keeps you warm! This chili was perfect for a cold winter night. Thank you for sharing this wonderful recipe! Hi Heather, oh my, we have never tried to figure that one out. We will see what we can do and get back to you. This recipe is great have made it several times as my DR advised me to go vegan I added steel cut oats for more meat-like texture and it works great also put lots of hot peppers and a little SRIRACHA sauce and it works well, thanks so much for the vegan cooking style as I have made it a life long change. PS I will include other ideas as time goes on if you like! Thanks for bing in touch. Happy you enjoy the chili recipe and love those tweaks! 🙂 Bravo! 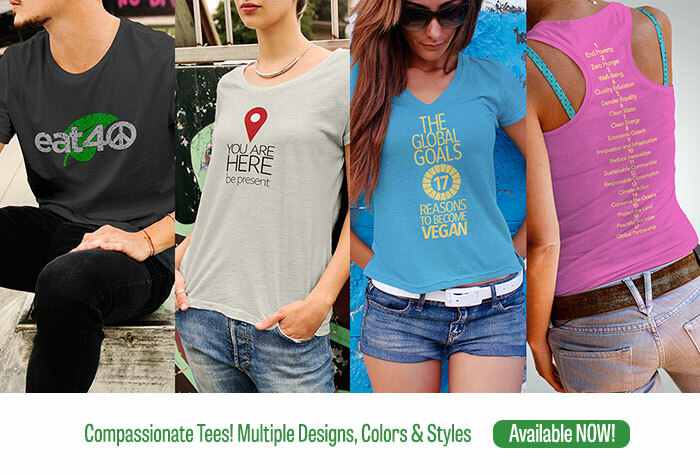 to you for going vegan – thats an awesome life change. Stay in touch, we would love to hear from you. Oh my goodness I am in love with this recipe! I’m what you call almost vegan , I’m dipping my toes in and seeing if I can do it . Anyway my whole family loved this even my dad who is not in to ‘healthy’ stuff. Question though , the garbanzo beans they weren’t very soft , is there a secret to get them a little less crunchy? Well, if the chickpeas are still a little firm, you definitely need to cook them longer. Are you cooking them from dry on the stovetop or with a pressure cooker? If from dry on the stovetop, make sure that they get a good soak first after an initial boil (like, boil for a minute, then soak overnight) then cook for your usual time. In a pressure cooker, add a few minutes and try just letting them sit in the pot with the power off. We use an Instant Pot and it has a warm feature after the cooking that slowly lets the pressure go down and really finishes the cook. If the chickpeas are from can, just cook the whole pot a little longer before serving. Hi! I am currently on the Daniel Fast and can’t have any sweeteners even natural ones. How do you think this would turn out without the agave? The Daniel Fast – we didn’t know about that one. We just read about it though and it sounds very interesting. The chili will be fine without agave (we’ve made it without the sweetener before). But, I would shred two carrots into the pot. Carrots have a natural sweetness and I don’t think they are considered a “precious” food and should qualify as a pulse. So they should be fine on the Daniel Diet. Believe it or not it does get cold in Phoenix! We are at 33 of a low today and this came in handy. Flavor is awesome and it was really easy to make! I am sure the leftovers are going to be insanely good! I think the key is to stir often like the recipe says. I had no issues with sticking. So glad that you enjoyed it and that it worked well. We LOVE having the leftovers the next day! I made this tonight (3/1/17), the first time I made chili from scratch I used canned beans, and substituted 2 diced organic carrots for the corn, and added 1/2 cup of TVP flakes. I also cut the 2 Tablespoons of chili powder down to 2 heaping teaspoons, because I have some powerfully hot chili powder, and it still came out very hot. Cooking requires fairly regular stirring. It was good, and thinner than the canned Amy’s organic vegetarian chili that I am used to buying. I will continue to tinkle with the recipe, trying soy fake meat crumbles, and maybe potatoes. Thank you for sharing. Thanks for trying the chili and taking the time to come back to the site and leave us a message. We appreciate it! I am not vegan, but this chili was absolutely fantastic. My family could not believe this was vegan and loved every bite. It was thick, hearty, and full of flavor. I added garlic but I use garlic in everything! 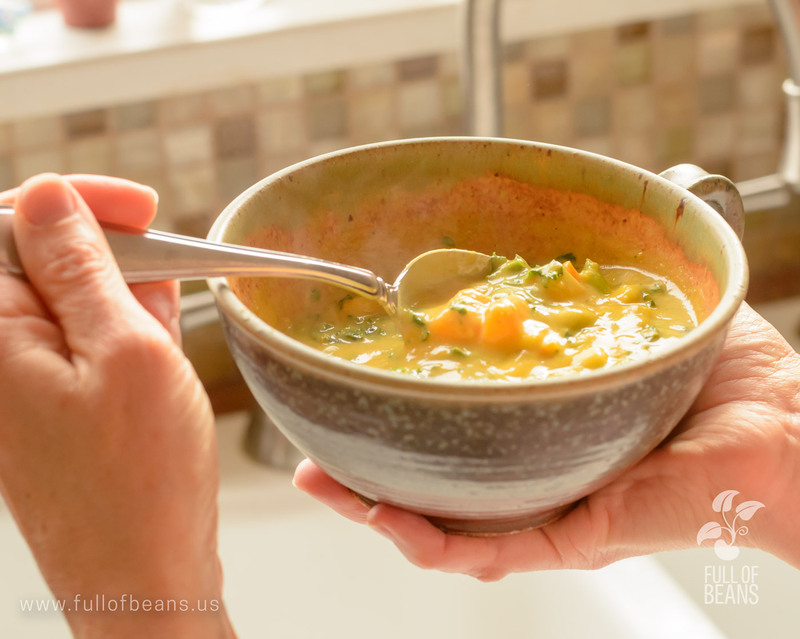 I am slowly transitioning into a more plant-based diet and this has become a go-to recipe in my household now. Thank you so much! Oh, this is wonderful! Thank you for taking the time to let us know about trying the chili. We really LOVE that dish and for all the reasons that you said. This chili is an awesome dish to help make the transition, so glad that you have added it to your regular meal plans. Please let us know if you need any help continuing on your plant-based transition (which we are so happy to hear that you are doing). I have made this vegan chilli many times.It is a favourite. Thank you. Catherine, thats wonderful! Thanks for letting us know. Just made this recipe for the first time! I am contemplating going vegan and at least trying to have a more plant-based diet. This was a winner recipe for me and my husband (who is no where near a vegan). I subbed the sugar with pure maple syrup and accidentally put in two tablespoons, but it still turned out great! I also used coconut oil instead of olive oil. I think I might try using all tomato sauce instead of paste next time, just because tomato paste can be a bit too condensed of a flavor for me, but there were no complaints from the hubby, so maybe I’ll keep it as is. I paired it with vegan corn bread and now I can’t wait to have this tomorrow! Please let us know how your transition is going! My father in law is one of those carnivores that shuns veggie dishes because vegan is associated with unflavorful around here. But he recently had a heart attack and has been trying to eat healthy, so once or twice a week I try to cook something delicious but still healthy. I dont have access to many health food stores, and I’m not even sure what a veggie crumble is. Do you have any other suggestions for an add in that would have the mouth feel of ground beef? Thats wonderful that you are helping him like this! Crumbles are usually in the frozen section with veggie burgers etc. They are usually made of a soy product and very similar to ground beef (without the fat and other issues). But, we usually make it without the crumbles, because its thick and flavorful all by itself. You could probably find some excellent products at mainstream markets. Depending on where you live (assuming US) Stop & Shop, Walmart, Publix, BJs, Costco would all have some sort of plant-based burgers that you could break up into the chili. You probably could find Field Roast or Tofurkey brand spicy “sausage” that would be really good. You could just slice them up, briefly cook them and toss them into the chili pot. Many supermarkets have “health food”, “organic”, or “veggie” sections where you can find vegan products of all sorts. Just ask (rather than wander about, LOL). Please let us know how it works out and if you have any other questions. Crushed tomatoes are an excellent idea! Sounds great. We’re delighted that you like the chili and that its been a hit. Recipes that please everyone (and maybe make them think again about going vegan) are one of our goals! Just two questions: how many calories in a serving, and how many cups per serving? I really enjoyed it! Best recipe of vegan chilli I’ve ever had! Thanks for sharing it. SO happy that you enjoyed the chili – thanks for the wonderful comment. You know, adding nutritional information to the recipes has long been on our “To-Do” list. But we haven’t been able to dive in and devote the time to it, yet. We really don’t have an accurate measure of the calories per serving at this time. Have you tried it and it seemed like there was too much liquid, or too “tomato-y”? We think it absolutely need the fluid from the crushed tomato. Please let us know. I was so glad to find a vegan chili recipe that didn’t call for any fake ground beef since I’m not a fan. This chili was incredible!! We ate the whole pot in 1 day. I will double the recipe from now on! I substituted the garbanzo beans for pinto beans just for preference and it was great. Thanks for the recipe! Not including “fake ground beef” is the way we prefer it. Of course, those products are extremely helpful for some people who are trying to transition from eating animals, so we appreciate that. But we try to go for whole foods, minimally processed, as much as possible. Hi! Just curious if you let it cook on the stovetop for 30 minutes after adding all of the ingredients, or if there’s any way I could dump it all in a crockpot and let it simmer all day? Let me know. Thanks! We usually let it simmer about 30 minutes after all the ingredients are in. You could certainly do it in a crock pot – that’s a great idea. We would probably sauté the onions first and then add it to the pot. Or, just toss it all in and go zero fat. You could cook on low for a day, or on high for 6 hours. It should be just fine! Enjoy the chili! 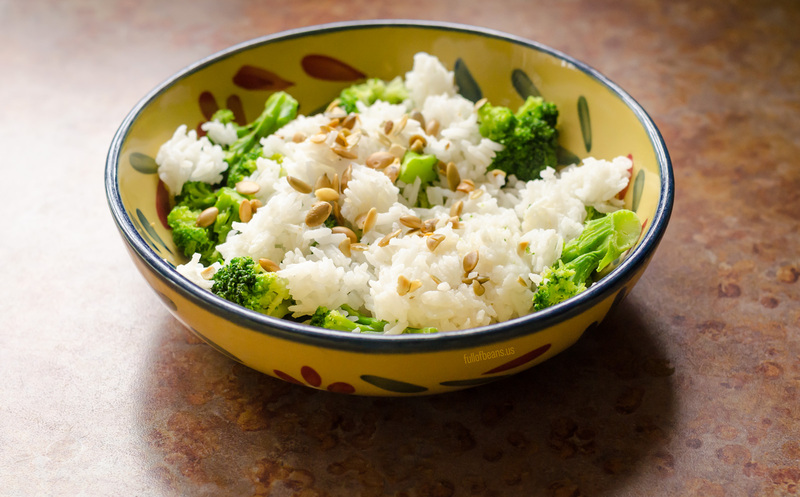 It’s one of our favorite standby meals. I made this last year for our Christmas Eve family get together. It was really thick and we ate it with corn chips. My daughter asked me to make it again. We will be on the road part of the day and have no time to do a bunch of cooking. I can basically dump it all together in a pot after sautéing the onions, heat and go! Oh, thats wonderful! Its the sort of meal that works perfectly for a busy day like that. Not sure about that, but give it a try and let us know! Its a forgiving recipe so it should be OK. I absolutely love this chili! It is the Best Chili Ever!!! So simple to prepare and I have served it with chips; with cornbread; and even over rice once. This is my go to chili. Thanks for the recipe! I absolutely love this chili! So simple to prepare and pairs well with chips, cornbread or even over rice. My go to chili from now on. Thanks for the recipe! Just made it for the first time. Is it really 2 tablespoons of chilli powder?! Mine is SO hot it’s burning the back of my throat!!! Is that a typo? Oh my, that doesn’t sound good. Not sure what you used for spice, but what we mean is the spice blend called chili powder – as opposed to something like a red chili powder/cayenne(which would be quite hot). So sorry that this happened – please double-check the exact spice and hope you try it again. Loving crockpot meals right now and this looks so good! I’ve been making this chili once or twice a month for a while now, it’s always enjoyed by everyone. I love it with fresh radishes and cilantro on top. Thats wonderful. Were so happy that you have been enjoying the Chili. Radishes and cilantro are a great idea, too!